El Delfin Verde (The Green Dolphin) is one of the foremost holiday camping sites within Costa Brava in Spain. Boasting a massive outdoor pool, immaculate beaches, excellent shopping locations and one-of-a-kind restaurants, this location is perfect for those who enjoy camping in luxury. Lux-Camp is happy to provide cost-effective booking services. Please do not hesitate to contact us directly for additional questions or to make a reservation today. As mentioned previously, those who wish to enjoy a magnificent camping holiday will not be disappointed upon their arrival. El Delfin Verde is not only a luxury camping site, but it is located within one of the most diverse ecosystems in Europe. What are the Main Benefits That I can Enjoy When Camping at El Delfin Verde? 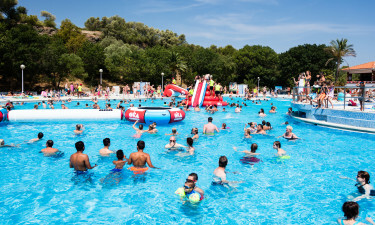 The pool provided at this holiday camping site is one of the largest in all of Catalonia. Furthermore, it offers depths of many different levels; catering to children and adults alike. There is a a pool bar, a restaurant specialising in Asian cuisine and a takeaway burger stand for those with a healthy appetite. Of course, one of the main attractions at El Delfin Verde is the choice of lodging that can be enjoyed. Guests can select mobile home sites, villas and private camping pitches for a luxury tent or a bungalow tent. All of these locations are found quite close to major amenities such as restaurants, beaches and other attractions. Still, they offer a tranquil escape from the more public areas. El Delfin Verde is also known for its sumptuous gastronomy. When camping in luxury, why not enjoy a truly wonderful meal alongside such conditions? 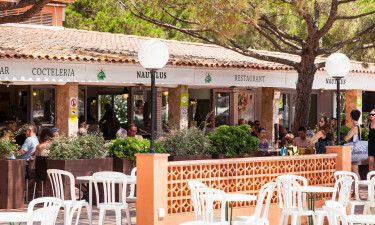 For example, the Restaurante Nautilus provides an informal and yet traditional dining experience that is ideal for the entire family. 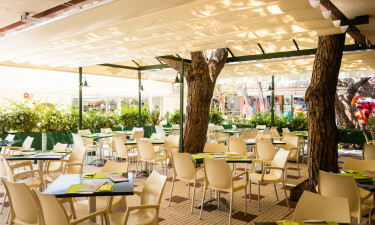 Or, visitors to this holiday camping site can choose to cool off with one of the many varieties of ice cream served at the nearby Gelato di Cuore. Additionally, a takeaway service is perfect for those who wish to enjoy a meal in the privacy of their mobile home or luxury bungalow tent. For a night out, bars such as Pirata and Chillout la Vela will serve up only the tastiest of cocktails. These are but a few of the numerous culinary experiences to be found here. 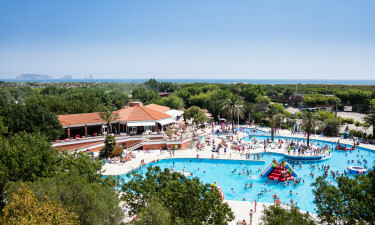 The commercial area of El Delfin Verde will provide the family all of the necessary amenities during any camping holiday. Not only is there a large supermarket and a bakery which opens at 7:00 in the morning, but there is also a clothing store and a shop that offers newspapers, magazines and books in multiple languages. So, all modern conveniences are found within only moments from one's mobile home, luxury tent or bungalow tent. Luxury camping in style and comfort has never been easier!